At JTCamp, we hold ourselves to a high standard of quality – we want our campers to enjoy themselves and get the most out of their holiday – and we don’t stop short when it comes to lodging, accommodation, and cuisine. JTCamp is located in Flims-Laax, which shares the Canton of Graubünden with other renowned resorts such as Davos and St-Moritz. Flims-Laax has an ideal altitude of 1000 meters, which makes for a healthy and relaxing stay. The camp accommodation, located within walking distance from downtown Flims-Laax, is surrounded by excellent sporting facilities and borders an alpine forest. Flims-Laax is graced by both lakes and mountains and has all the sports and cultural facilities a camper could desire: Golf, tennis courts, a skating rink, swimming pools, lake, the Rhine river for rafting, sport halls, an inline skate park, football fields, via ferrata, an astronomy observatory and a whole lot more! Take a look at all of the sports, activities, and excursions we offer our campers during their stay. Campers and staff are housed in the Rider’s Hotel, which is a modern building ranked among the 150 best-designed hotels in the world. They sleep in spacious rooms equipped with two beds (single rooms are available upon request) and private full bathrooms, en suite. The Rider’s Hotel is equipped with Minergy eco-friendly systems. Fresh towels are always provided and housekeeping is performed on a daily basis. Twice-weekly laundry service is also included. Single rooms are available for an extra charge. Enjoy a 3D - Visit of a room using this link or this link . Important Even if you see more than 2 beds, this is just as an example of setup possibilities. Each room will only accommodate 2 campers - guaranteed! Our Head Chef has extensive experience in many different styles of cuisine and pleases the palates of our international guests with lunch and dinners served family-style. Our well-balanced menus ensure that courses always consist of fresh and local products. JTCamp never serves pork and insists on using only fresh vegetables and fruits. Breakfasts consist of a large buffet, with new items daily. 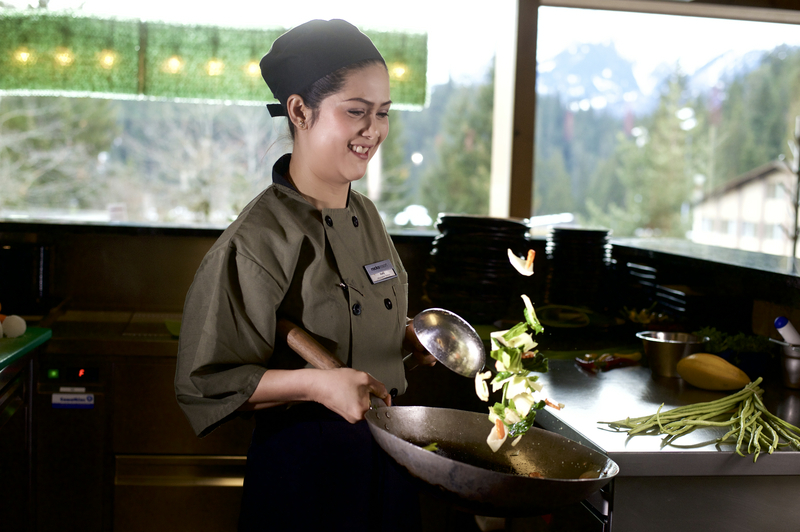 Every week, we surprise our campers with themed buffets, barbeques by the lake, and mountain-top picnics! Throughout the day, a large basket of fruit and fresh water are always available for campers. Snacks are provided during the afternoon: fruits, and, twice a week, a chocolate-cereal bar. Special diets can be catered for: Vegetarian, Lactose-Free and Gluten-Free. Also, a surprise awaits campers celebrating their birthday while at camp. Our meals are prepared by experienced chefs well-versed in the art of catering to guests from many nations. Full meals are served to the table by our professional staff. Fresh local products combined with great new tastes help us create food the campers love. We are proud to make the quality of our catering a priority.